As often happens when researching stories,, I have found a few discrepancies! A story tells of Robert arriving in S.A. aboard the Anna Robertson in the company of his wife Alison and that they lived for a while in Gilles Street, Adelaide, before acquiring land on Dry Creek in 1843. After looking at the Biographical Index of S.A., it seems Robert Milne married Alison Knox in Adelaide on the 4th of April 1844! Alison Knox was born in Aberdeen., Scotland in 1818. Alison’s father was called William. Knox. There was a man by the name of William Knox living in the Dry Creek area. Did they all travel together or did Alison meet Robert Milne after he arrived in Adelaide? Robert Milne was born near Aberdeen in Scotland. In 1839 he arrived in South Australia aboard the ‘Anna Robertson’. Robert was 28 years old. Although Milne settled his land at Dry Creek in 1843), the transfer of title for the land was dated 19 th February 1853). Giles, the previous landowner, could have resold to Milne on the ‘ Lease – Purchase Scheme ‘- Title not passing until payment completed. The Title was for ‘Drummener’. After Robert Milne’s death in 1866, the Title was transferred to his wife and three others as Trustees for his son Spencer A. Milne. Trustees’ were Alison Milne, George Phillips, Ironi Flonger of Adelaide, Robert Symons Kelly – Farmer of Modbury and James Campbell – Farmer of Dry Creek.. The Title passed to Spencer Alexander Milne on the 2nd of October 1889. Spencer A. Milne was born on 22nd March 1858. so it would appear he was over 31 years when he actually inherited the property. Robert Milne named his property ‘Drumminer’ after Drumminer Castle in his native Aberdeenshire . Sometime over the years the spelling changed to ‘Drumminor’ as sometime happens with names, as can be seen with the Title! The large two storey residence was built in the ‘Georgian’ style, perhaps to mirror the architecture of the Castle from which he borrowed the name. The house was built as a complete unit, this can be verified by the original quoins still in place on the corners of’ the building, so it appears the basic stone structure was not added to over the years, (at least not until after the 1930’s). The house was built of local stone and the roof of imported Welsh slate. The interior wood paneling of Mahogany and the solid Cedar wood, used in much of the construction, is thought to have come from the wood of ships. The extensive wine cellar is as wide as the building and half the depth and although Robert Milne was known to keep a ‘fine cellar’. He would not have considered himself a vigneron. Found in the cellar in recent years, was a cask date stamped ‘1795 – London to Sydney – Gordons Gin’. This is in the possession of the present owners. Robert Milne was perhaps one of the district’s most progressive agriculturist’s and as such was thought to be the first farmer in the district to construct catchment drains on his property. He was one of the very first settlers in the colony to use barbed wire fencing and certainly, the first farmer in the district to use it. Some can still be found attached to posts on the property. In June of 1854 he wrote to the ‘Observer’ advocating the general use of wire in place of post and rail and ‘live’ fences. He stated in a portion of the letter, “I find that a 3 wire fence can be put up cheaper than a 2 rail and post fence: the cost will be 7s. per rod and £112 per mile”. The first wire was a thick black untempered wire known as ‘bull wire’, this did not resume its shape when leant on. At the Adelaide Exhibition of 1855, a wire was on show called ‘Bright wire’. ­A more tempered, more elastic wire but this was expensive. .’Live’ fences, in the English style, were much favoured by early settlers in the district. Remains of these ‘live’ fences were still visible in the less closely settled parts of the district until quite recently. Prizes were given at district shows for the best five rods of ‘live’ fence. Plants considered suitable included the Common Rose bush, Dog Rose. Prickly Acacia, Boxthorn. Kaffir Apple. English Furze and Olive. Two men could lay down rose cuttings round an eighty acre section in one week, and ‘the only expense was trimming’ when the bushes grew! ‘The unprecedented influx of immigrants to the neighbouring colonies for the next Year or two, will open up such a market for the produce of the corn grower as will inevitably, assure good prices’. His canny foresightedness proved correct. Although Ridley invented the ‘Reaping Machine’ in 1843, Robert Milne in reply to a questionnaire in 1854 stated that “no new or improved agricultural implements had been introduced into the district”. Another district farmer had replied. “Reaping machines are injurious to the land, fill it with weeds and prevent good crops. Hand reaping is best”. The reaping by hand continued on many farms as late as 1874, where large areas of crops cut for hay, were still done with a scythe! However, in 1862 on the Milne property, a large part of the wheat crop was reaped by machine and threshed with a threshing machine. Robert Milne was one of the first five Councillors, when the District of Highercombe was proclaimed on July 14th 1853. He became the second Chairman of the Highercombe District Council and as well as being a successful farmer, was a member of the Agricultural Society, a Magistrate and an Officer in the Nth Congregational Church from the time of its formation. Under quite large areas of the district, especially Hope Valley, brown coal or lignite, had been found, but proved too expensive to extract commercially. There are a number of cases of people sinking wells in the district and discovering a seam of coal, as did Milne in 1843, whilst sinking a well on his property. In 1861, Robert Milne, then Chairman of the Highercombe Council, granted the use of his land for the first annual Modbury and Upper Dry Creek, ploughing match. A gun was fired at 10.00am and 29 entrants, with a class for lads under seventeen, commenced ploughing. “Each man and boy to plough 1/2 acre in five and a half hours”. First prize was “one of Hornby’s best ploughs and l pound”. As Milne was described as ‘The Squire of Modbury’, he presided at the banquet held at the Modbury Hotel. 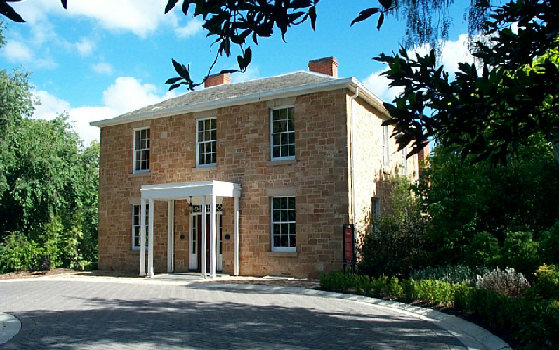 ‘Drumminor’ was the home of the Milne family for nearly 100 years. Robert and Alison Milne had 9 children, five females and four males, tragically six of their children died very young. A boy just 10 hours old in June 1845 – no name was recorded. A girl Jeannie Findlater, perhaps one of the most tragic, born in 1847 – died 1849 from burns received when a kettle of boiling water fell from the open kitchen fireplace. A boy, James Robert, born 1850 – died 1856. A boy William Knox born 1854 – died 1855. A girl Anna Rosina, born 1856 – died 1857, a girl Mary Rosa born 1862 – died 1865. Another daughter Alice Harriet, survived to adulthood, before passing away in 1881, aged 32 years. The two remaining children, a boy Spencer Alexander, the heir to the Milne property, reached 79 years and a girl Margaret Bameard (Bemard?) who passed away in 1930 aged 78 years. Robert Milne died in August 1866, aged 55 years and was buried at West Terrace Cemetery. His wife, Alison lived until 1908 when she passed away aged 92 years. The title of the ‘Drummener’ property, passed to a son Spencer Alexander Milne in 1889. Spencer Milne died in 1937, and the property was sold to A. & 0.J. Willison of Modbury. In 1962 – ‘Drumminor’ house, which had become derelict, was in need of extensive repairs. It was purchased and saved by Mr. & Mrs. Gavin Sandford – Morgan, who restored the house as near to the original, when built in the 1840s. (Mr. Sandford – Morgan was a well known collector of antique cars, the collection of which included the only ‘Le Mans Jaguar’ left in existence). In 1974 the ‘Drumminor’ once again changed hands to become the prestigious ‘Drumminor Restaurant’ run by Mr. V. & Mr. J. Ieso. The Restaurant closed its doors with the last social function, perhaps fittingly being held, on New Years Eve 2000 (The Millenium). Since that time the ‘Drumminor’ property has been sold to Brenton Hill and Wendy Blades. The old buildings in the grounds that were falling into ruins, the stables, sheds and out buildings, have been stabilised, also the old cottage near the entrance to the property. These all form part of the layout of the new and extensive buildings that is ‘Harrison’s Heritage Park’ Funeral Directors. These new buildings have been built on the land facing West, near the old stables and outbuildings that overlook the Golden Grove road, so ‘Drumminor’ house has been left untouched, as heritage demands. With a lot of expense and thought, the mix of old and new, blends together very tastefully and is a credit to the new owners. 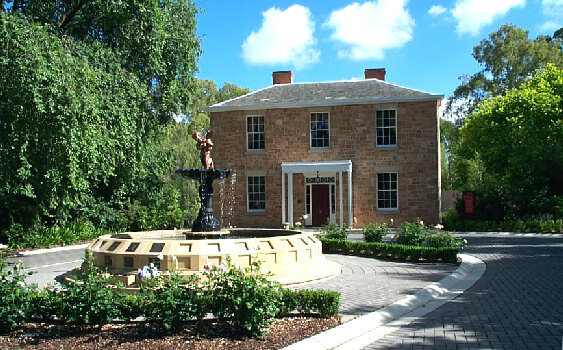 ‘Drumminor House’, has been left as an historical monument to times past, overlooking what are now called ‘Drumminor Gardens’, the cemetery part of ‘Heritage Memorial Park’. A fountain has been placed as a central point to the gardens in front of Drumminor House and named in memory of Jeanie Milne. the little girl who died so tragically in 1849. No record could be found of the burial of the little girl – there is every possibility she was laid to rest somewhere on the property as so often happened with babies and small children in those days. The present owners felt the fountain centre piece, would be a fitting and tasteful tribute to her memory and ultimately to the Milne name, that was so much a part of the early European settlement of the area. Ian Auhl’s book. From Settlement to City – A History of the District of Tea Tree Gully. The City of T.T.G. Local History, Local History Room V. Files, and staff & volunteers. SAGHS – South Australian Births 1842 – 1906. South Australian Deaths Register 1842 -1915. With thanks to Brenton Hill of Harrisons Heritage Memorial Park, a present owner of the ‘Drumminor’ property, for his time and help with extra information.